David didn’t exercise, he had high blood pressure, was overweight, and worked 10 to 12 hours a day. Dave was a manager of project managers. He traveled all over the world but on a business trip to Austria he developed a head ache that lasted day and night (he would learn later it was a warning sign of stroke). He took aspirin, Tylenol, etc. but the head ache would not go away. He returned home but the headache still would not go away. Some days passed when at 7:30 in the morning he came down stairs, collapsed and fell to the floor. He lay there until 8 PM when his brother came and called for an ambulance. Emergency personal administered CPR. Dave was in bad shape. He and his wife Shirley were separated but when their son called she went to the hospital right away. Shirley was unaware he had a stroke until the ER doctors told her. Dave was in a coma for four or five days the doctors questioned whether Dave would survive, as Shirley said “they would have to go day to day”. Dave did live but he survived with aphasia, partial use of right leg, and almost no use of his right arm. How did the stroke affect Shirley? They had an active life together. She worked and had plans to further her career but then Dave made a decision to separate. But the stroke had change all that but now that Dave was in the hospital, needed months of rehab, and most importantly needed a loving companion throughout his life, he needed Shirley to guide him through all that. Shirley put “all her efforts into taking care of David”. They used to run together and now she helped in doing exercises and walking. To say the least he was grateful he would lead his life differently. They replaced activities they used to do with other things David could do. As David recovered he and Shirley switched roles. She went to work David does the housework. He makes the meals, does the laundry, and watches soap operas; not really. When asked how has your life changed Shirley responds she has too much on her plate and at times she could just scream but then she thinks about things like Stroke Camp and that renews her batteries. She thinks about God and Jesus and that renews her faith and strength to go on. Shirley is thankful that David was spared so that God would touch his heart and is grateful David didn’t die on that operating table. When asked about God in regards to Dave’s recovery he says he’s not sure. Still with all those disabilities he rides a three wheel, motor cycle, still works, enjoys life, and most of all “still alive”. October 3, 2012 is the date that's been set for this year's Ironman Golf. It will again be at Hillcrest Golf Center in Washington, IL. If anyone is interested in joining us, getting pledges, and golfing from 7:00 am until dusk, please give a call to the Stroke Camp office at 309-688-5450. Yep, you read that right. If you want to join us, you will have to golf non-stop from 7am until dusk. Now what golfer doesn't dream of that? Pledges will be by total holes played, so the faster you play the more holes you play and the more holes you play the more the stroke survivors will benefit. If we get enough players and pledges, we can even close the course and have it all to ourselves. If not, as in past years, our pledge golfers have priority on the course and golfers who are not part of our group graciously stand aside and let us play through. Also, if you wish to support our golfers, we would appreciate any help you can provide. We need cart drivers, food and drink for the golfers, pledges solicited, golf balls, tees. Stuff like that. This has been a great fund-raiser for the past four years! Fore! So, please give a call to the Stroke Camp office at 309-688-5450. 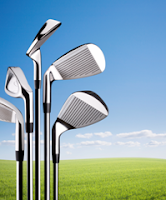 For the second year, Pat and Dawn Robinson have organized a golf outing that promotes stroke awareness and benefits Retreat & Refresh Stroke Camp™. This year the outing was held at Pine Lakes on June 8th. Almost 100 golfers teed up trying to win some of the prizes that were awarded. The fundraiser brought in over $2,000 to benefit stroke survivors who attend stroke camp. At the closing of the event, the Chime Strokers, our stroke survivor/caregiver chimes choir, entertained the golfers followed by the awarding of prizes and raffle items. It was a great time and a beautiful day that was perfect for golf. A big thank you to Pat and Dawn along with all those who golfed and participated in any way. Hope to see you next year. 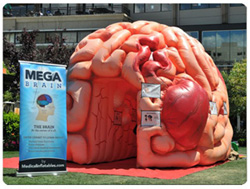 Since March 2012, Retreat & Refresh Stroke Camp™ has been exhibiting the MEGA Brain in different communities across the country. The Brain has been to Kansas City twice, Peoria, IL, and Phoenix, AZ. By the end of the year, it will also be at the Coral Ridge Mall in Coralville, IA the Colorado State Fair in Pueblo, CO and the KC Black Expo. The exhibit along with the Stroke Learning Center, created by Chuck Jones, has attracted literally thousands of people to the exhibit. Members of communities are learning about the functions of the brain as well as the signs and symptoms of stroke. Thanks to the generosity of Genentech, Retreat & Refresh Stroke Camp™ is being recognized as a leader in educating the public about the prevention, signs and impact of stroke. “We have to do this. We have to do Stroke Camp” This’s what Lindsey said to Kyle after her first experience at Stroke Camp in Iowa. Lindsey had gone to camp only one night but she was smitten. Lindsey and Kyle are music therapists from Cedar Rapids Iowa and he had never heard of Stroke Camp but she was so unrelenting that he went to the next camp in Rockford Illinois, over 160 miles away. The two of them went and as Kyle says they had a “great experience” and they both got “hooked” on going to camp. The first year at camp Lindsey recalls a young survivor who was determined to go back college. It was then she knew each survivor has their own story to tell. After hearing the stories each survivor has gone through Kyle says “I will never complain about anything ever again.” The stories made him feel like a “sissy”. At a group session with survivors, caregivers, and support staff Kyle asked how survivors and care givers had managed to get through what stroke had done to them, “How in the world do you get through it, how as a couple do you stay together”. He took their advice and applied it to his own marriage “I want our marriage to be strong enough to survive something like stroke”. Lindsey tells about how Stroke Camp has changed her approach with every one of her patients. She says she was very book smart about and how music affects the brain but as Lindsey now says she was “dumb” in respect to what individuals, both survivors and caregivers go through, and realized this as a result of Camp and dealing with stroke survivors. The couples advice to survivors and caregivers is never give up, never quit, and keep looking for ways to improve. Formal therapy stops but you can always look for options on ways to improve. They finish saying “We get paid to do this? !” Kyle and Lindsey have so much fun they can hardly believe that they do. It isn't because they get paid that they come back each year; it is because of the heartfelt joy of being around such wonderful people. We would like to welcome Lauren Kramer, our new Coordinator of Support Services, to the Retreatand Refresh Stroke Camp™ staff. Lauren has been with us full-time since the end of February and works behind the scenes for RRSC. Lauren is a board-certified music therapist and started volunteering at camp in the summer of 2009 as one of the music therapists and enjoyed it so much that she wanted to spend time with us in other roles. As luck would have it, we were in need of an employee and she was eager to jump on board! Lauren will be doing much of the behind-the-scenes work for all of our camps this year in addition to attending quite a few camps in different administrative positions. She ran our 5th grade education program this spring and has helped with fundraisers and other special events. Lauren also co-conducts our local Chime Strokers group and enjoys the opportunity to use her music therapy degree as well as her other talents. This story was also published in the June/July Camp Newsletter. Rosie was 45, an independent woman with a great attitude; she greets most people with a smile and says “whatcha doin”. But her great attitude didn’t protect her from stroke. It was on a Thursday in May 2003, she went to see the ophthalmologist because something was wrong with her right eye. She was told to see a neurologist. Rosie wasn’t able to get the appointment for weeks and after a short exam, the neurologist told her she must go to the hospital. At the Loyola Medical Center it was found she had a brain aneurism on the left side. She went to surgery immediately, it lasted nine hours. And five hours after the operation she had a hemorrhagic stroke. Her parents were told she had a 50/50 chance of living. She was in rehab for four months. She had to give up her lovely home and move in with her parents for four years. Then in 2006, Rosie met Ken at Marianjoy Rehabilitation Hospital’s 4th of July picnic. They are like matching pairs of salt and pepper shakers. Ken had a stroke on the right side of his brain; Rosie had one on the left side. They got married in Reno Nevada in April, 2008 and you would think they had a fairy tale marriage but on January 16, 2010, Rosie’s son Nicky died at the age of 24. She still has a good attitude but it’s not the same. She dreams of the two of them together and greatly misses the time they had. Rosie says she can deal with the stroke but she has trouble dealing with the death of her son. There are no guarantees in life.